Debenhams Ottaway launched its competitively priced fixed and capped fee debt recovery product, DebtFast, in 2012 but has followed this up with a dedicated website which contains a wealth of information for creditors and aims to demystify the debt recovery process for businesses. Inspired by the theme of predictable and fixed costs advocated by Lord Justice Jackson, DebtFast not only fixes costs of undisputed debt claims but also provides costs certainty for insolvency petitions* and disputes* within the small claims and Fast Track. It also enhances creditor recovery prospects in debtor insolvency via its network of forensic insolvency practitioners. 1. The DebtFast team acts for clients in all sectors but has particular expertise in acting for clients in the recruitment, advertising, construction, education and healthcare sectors. 2. Debenhams Ottaway is a leading Hertfordshire firm headquartered in St Albans. Its commercial litigation team is ranked in Chambers and Legal 500 and it was recently a finalist for Insolvency Law of the Year in the TRI Awards. 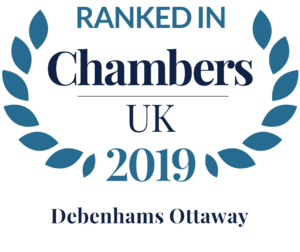 Debenhams Ottaway is a multi-service, innovative law firm based in Hertfordshire, known for delivering clients outstanding service and our award winning legal advice. We are proud of our past, progressive in our outlook and unrelenting in our dedication to growth through doing more for our people, our personal and business clients and our communities.